I've been using ML on my 60D and now I've moved to a 6D. I know I need original 1.1.6 Firmware to do a clean install before aplying ML but I can only get the 1.1.7 from Canon's webpage, because they updated it. Where can I download the original 1.1.6 firmware? 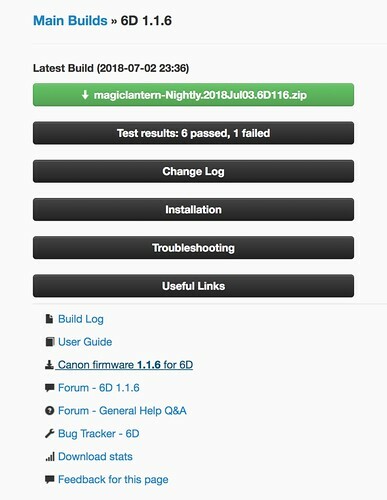 As the link on the Nightly Build page drives you to Canon lastest firmware (1.1.7) maybe that should be corrected. Anyone can follow that link by mistake and end trying to ML over the 1.1.7 firmware (or just feel lost, like I was). and use linked firmware file. He is referring to the link in reply #1. Ok--that page says it is "EOS 6D Firmware Version 1.1.6 for Windows" but the download link is for 1.1.8. Yeah, confusing.